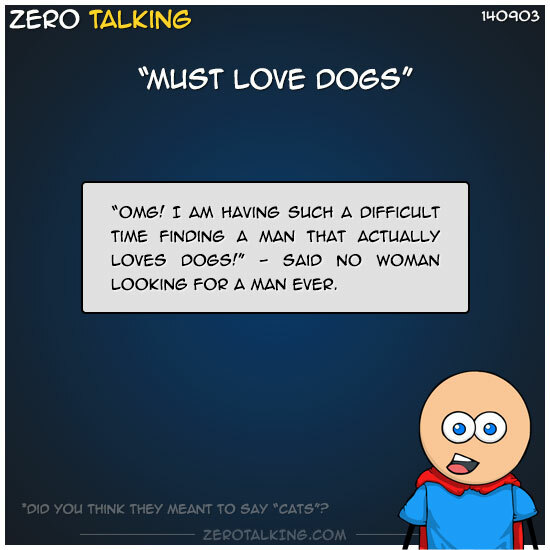 That awkward moment in online dating where it really seems like women have an exceptionally difficult time finding men who love dogs. It is said so often you would think it’s an extremely rare quality in men. I mean above all others. Nowhere else are women so consistent with insisting that their potential date love something or have a particular quality. “Oh my god! I am having such a difficult time finding a man that actually loves dogs!” — said no one. Ever. Enough with “Must love dogs” already. “Must love MY dog”, I can understand. You want them to love your dog as much as you do. I get it. They can be an assclown, but they must love *your* dog. Uh huh. But seriously, what decent human being doesn’t love dogs? OK, maybe some people are allergic to dogs, have had a bad experience with dogs, or just don’t like the little ones, or something, but still — who can’t see the value or joy in having dogs? Saying these things says a lot more about you than “Must love dogs”. And please don’t get me started on drama and your whole lack of wanting any of it. And the list of things you hate? Unnecessary! I repeat, no one likes drama! And no one likes traffic! And no one likes mean people! Just mentioning a bunch of things you hate makes you sound like someone to avoid, not someone to love. No one wants to hang out with the person who is always complaining about things. You want to attract a good man with whom you have things in common? Talk about what you love. And don’t pull the “I only wrote 200 characters because I don’t like talking about myself and would rather talk in person… And no one reads profiles anyway, they only look at pictures” crap. And stop posting weirdly angled selfies that are just an excuse to show your cleavage. Show some personality instead. Take a chance. If you love dogs, say so. If you love co-ed naked underwater basket weaving, say so. But if you love to laugh, well, you might as well be saying that you love to breathe. And one last thing, if you’re having trouble finding good guys, it might be because your height requirement is set to 6’1″ and you insist they live within 5 miles of you and make $100k or more per year. PS. If your online dating site provides you with the opportunity to post 20 or more photos of yourself (ie. selfies), I would strongly encourage you not to. It’s a trap. It doesn’t take us guys 20+ photos for us to figure out what you look like.